The Great Hall, Mississauga Civic Centre | FREE and all are welcome! Join us on March 3 for hoop dancing by Lisa Odjig, featuring singer/drummer Ian Akiwenzie. Hoop dancing is a traditional story telling dance and teaching dance. The hoops represent our connection to the earth, water, animals, birds, and to each other with a message to take care of Mother Earth. Lisa Odjig is Odawa Ojibwe from Wikwemikong, Manitoulin Island, Ontario. 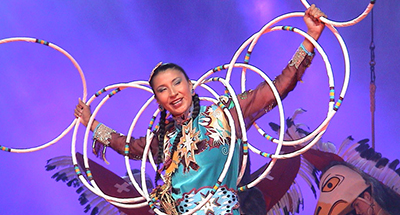 She has won six Hoop Dance Championship titles throughout Canada and the United States. She is the first woman in the history of the Annual World Championship Hoop Dance contest in Phoenix, Arizona to win World Champion Hoop Dancer. Ian Akiwenzie is from Neyaashiinigmiing First Nation and has been a singer and dancer since the age of four. He began touring across Canada and the United States at the age of twenty-five with various dance troupes and sharing his culture with other performers.